The scientific team, led by Prof Abhijit Chakraborty of Physical Research Laboratory (PRL), Ahmedabad, have found a sub-Saturn or super-Neptune size planet (mass of about 27 Earth Mass and size of 6 Earth Radii) around a Sun-like star. The planet goes around the star in about 19.5days. The host star itself is about 600 light years away from the Earth. The discovery was made by measuring the mass of the planet using the indigenously designed “PRL Advance Radial-velocity Abu-sky Search” (PARAS) spectrograph integrated with 1.2m Telescope at PRL’s Gurushikhar Observatory in Mount Abu, India. This is the first of its kind spectrograph in the country, which can measure the mass of a planet going around a star and with this discovery India has joined a handful ofcountries, which have discovered planets around stars. Very few such spectrographs exist around the world (mostly in the USA and in the Europe) that can do such precise measurements. The surface temperature of the planet is around 600°C as it is very close to the host star (7 times nearer than Earth-Sun distance). This might make it unhabitable, but such a discovery is of importance for understanding the formation mechanism of such super-Neptuneor sub-Saturn kind of planets, that are too close to the host star. The name of the host star is EPIC 211945201 or K2-236. 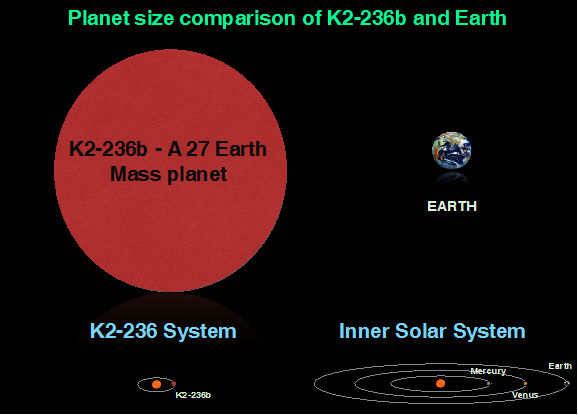 Hence the planet will be known as EPIC 211945201b or K2-236b. Initially, the source was found to be a planetary candidate from NASA K2 (Kepler2) photometry because it was transiting, that is the planet body comes in between the star and the observer on Earth as it goes around the star and therefore it blocks a tiny amount of star-light. By measuring the amount of light blocked by the planet body, we can measure the diameter or size of the planet. It was found to be 6 Earth radii. However, The K2 photometric data combined with false positive probability calculations was not sufficient to confirm the planetary nature of the system. Therefore, an independent measurement of the mass of the body was necessary for the discovery, which was made by the PARAS spectrograph. 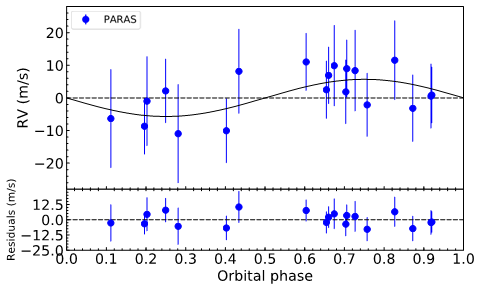 The gravitational pull caused by a planet on its host star makes it wobble around their common center of mass, which shifts the spectra and can be measured in terms of Radial Velocity using precise and stabilised High Resolution Spectrographs, like the PARAS. The PRL scientists observed the target over a time-baseline of 420 days (in about 1.5 years) using the PARAS spectrograph for probing the nature of the system. By measuring the amplitude of the wobbling of the host star, the mass of the planet was found to be 27±14MEarth. Based on the mass and radius, model-dependent calculations suggest that the heavy elements, like ice, silicates, and iron content is 60-70 % of the total mass. This detection is important as it adds to a sparse catalog of confirmed exoplanets with masses between 10-70 MEarth and radii between 4-8 REarth, whose masses and radii are measured to a precision of 50% or better. Only 23 such systems (including the present) are known to this date with such precise measurement of mass and radii. Figure Caption:Radial Velocity (RV) data points of K2-236, observed by PARAS with 1.2m telescope of PRL at Mt. Abu. Black solid curve represents the modeled RV curve. The model shows the wobbling of the host star and its amplitude gives us the mass of the exoplanet K2-236b. The research work will appear in the June issue of the Astronomical Journal owned by the American Astronomical Society and published by IOP Publishing (the DOI of the article is 10.3847/1538-3881/aac436).